How to draw a character from Thomas Was Alone: Draw a straight line, well done, that’s a great straight line. Now draw a shorter line coming off it at 90 degrees (clockwise) draw a third line equal to the first again 90 degrees from the second. Finally join up the third and first line. There you go, you should have a rectangle. Give this rectangle a relatively common name and you’ve created your own Thomas Was Alone character. 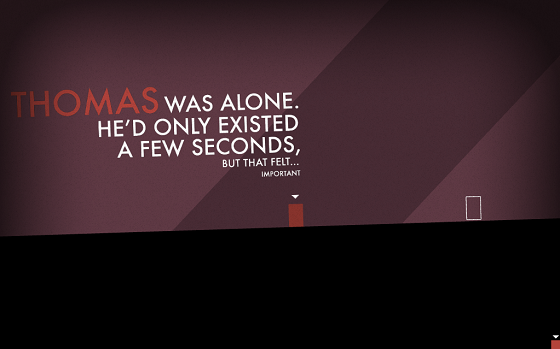 Thomas Was Alone is a freshly released indie title for the PC. 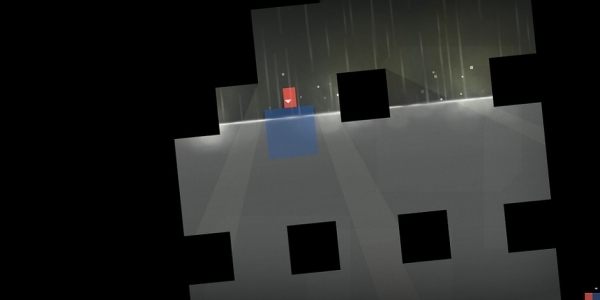 The game is a puzzle platformer, you will often have a number of rectangles and squares on the screen at once, with a clear goal at the end, the issue comes with certain shapes having different abilities. For example a simple puzzle that is used quite a lot in the game is that Christopher can’t jump very high at all, so you have to position the taller Thomas at the base of a platform and use him as a step. The game revolves around the story of the worlds first self-aware artificial intelligence and their travels through minimalist areas avoiding toxic water, spikes and pixel clouds along the way. The game itself provides a very simple aesthetic done well. The block characters and the solid black platforms work well together slightly juxtaposed against the details of the background pixel clouds and toxic. Something that makes this game work so well, and pulls it away from a glorified flash game is the sound design. The music is an almost painfully relaxing affair. Chilled piano melodies mean this game is one of those great examples of games you can lose yourself in. I found myself just sitting and playing the game for an hour at a time without even noticing the minutes pass. The one issue I have with the audio is an abrupt sound effect to symbolise one of the shapes meeting their goal or jumping. The sound is something you’d expect from the Atari 2600 and when you have the volume on high to enjoy the music it can be quite jarring. One of the reasons this game entered a number of people’s consciousness was because of the narrator, Danny Wallace. For most people Danny Wallace is known due to his XFM radio show or voicing Shaun Hastings in Assassin’s Creed. For those that aren’t too familiar with his work I heartily suggest reading his books Join Me and Yes Man as they were my introductions to him. With Thomas Was Alone it’s hard not to see why Danny Wallace was a great choice, his voice is similar to Stephen Fry’s in Little Big Planet, he is able to give emotion to the words and the characters without being overly dramatic or cheesy. His voice goes well with the music and plays well with the simplicity of the whole game’s design. Obviously Danny Wallace wouldn’t be getting such great praise from me if it wasn’t for the script, and quite simply this is the game’s greatest strength. 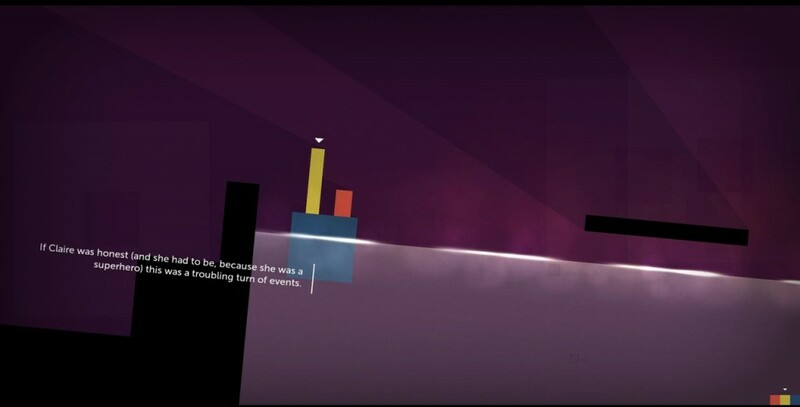 Mike Bithell, the game’s creator, has produced more emotion and empathy for these blocks than a life time of watching Eastenders could ever conjure. These basic shapes on the screen without faces are capable of being loved or hated by the player based on the narration of Danny Wallace. Learning the different motivations for the characters is a joy, be it Thomas feeling lonely, Laura being afraid that the others will only be using her to bounce off and not really liking her, or my favourite Claire, the only block that can float and as such believes she is a superhero. All of these traits and abilities lead you to pick favourites, never in my life did I think I would have a favourite square or rectangle out of a selection. This game is indie, and by indie I mean it’s true indie, this was made by one man doing it in his spare time, and that kind of dedication should be rewarded anyway. The game’s simple aesthetics are a design choice and thankfully not down to apathy or money. The game’s puzzles are easy and hard at the same time, getting your head around the physics of a square is a learning curve. The only area that the game fell down for me is certain puzzles require a rinse repeat fashion for a number of shapes, move block here use as step, move next block along and repeat, do this to get up 6 steps. 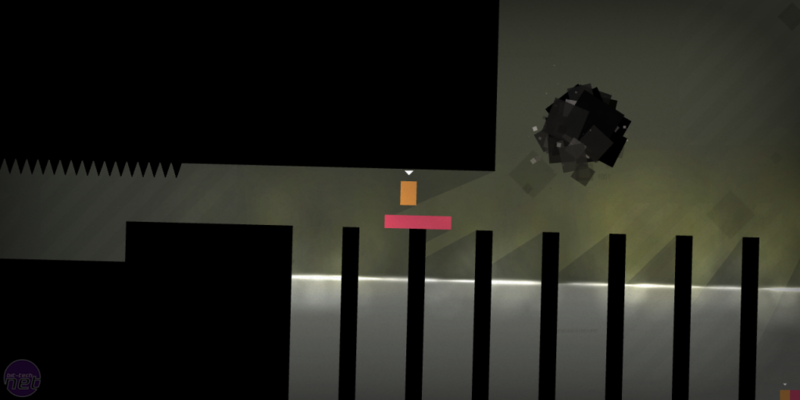 At this stage the puzzles aren’t challenging but more time-consuming which is not as fun. Thankfully the game doesn’t resort to this too often and generally you can sit and ponder for a minute on how to successfully achieve the level’s goal. Overall this game is worth picking up, it doesn’t take a huge computer to run so for a quick pick up a play on a laptop it works a treat. The story is a pleasure to experience and even if you are playing on your own in a room, giving this game the opportunity to shine through a decent set of headphones will draw you in and envelope your aural and visual senses with minimalist pleasure. This game should be held in the same light as Braid, VVVVVV and Limbo, it makes you feel for the characters and it has a style of its own. Hopefully it will hit the mainstream and the greater masses can give it a go and not just those that keep an eye on the indie scene.